This kind of information helps you to reach out to contacts that are actively engaged with you, improving your responsiveness. And helping you to move leads on faster, providing help and advice when they need it. This is an essential Workflow for use with Conversion Forms and Landing Pages in particular. The Notification Action picks up the information added to your forms and emails it to the members of a Jumplead Users team. 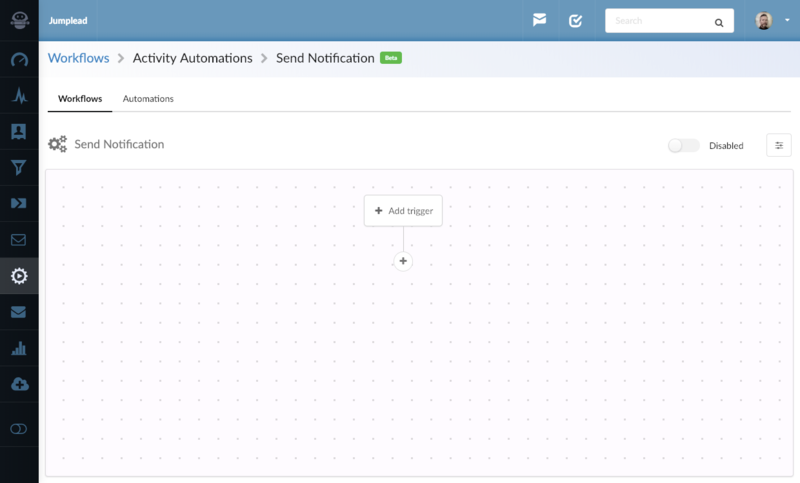 You can create different teams depending upon who you want to receive different notifications. To create your Notification Workflow, go to the Automations section and create a new Workflow. 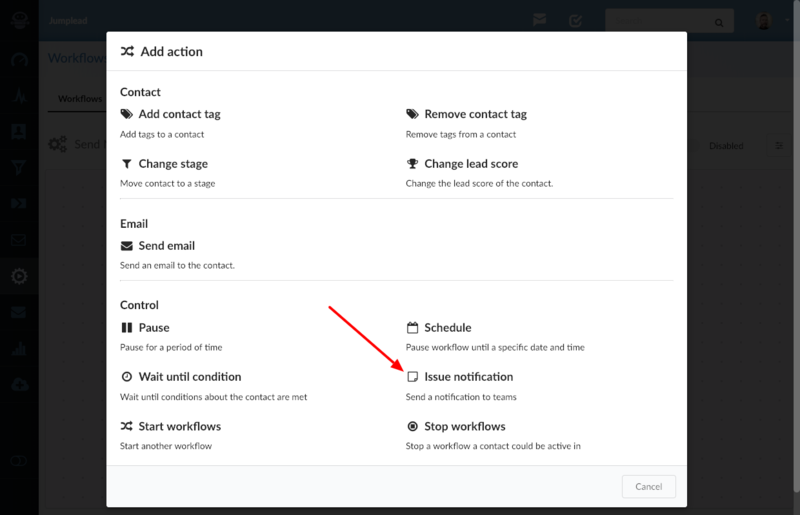 Give your Workflow a name and make sure that it can run more than once for a contact. Save the Workflow and in the visual editor click the 'Add trigger' button. 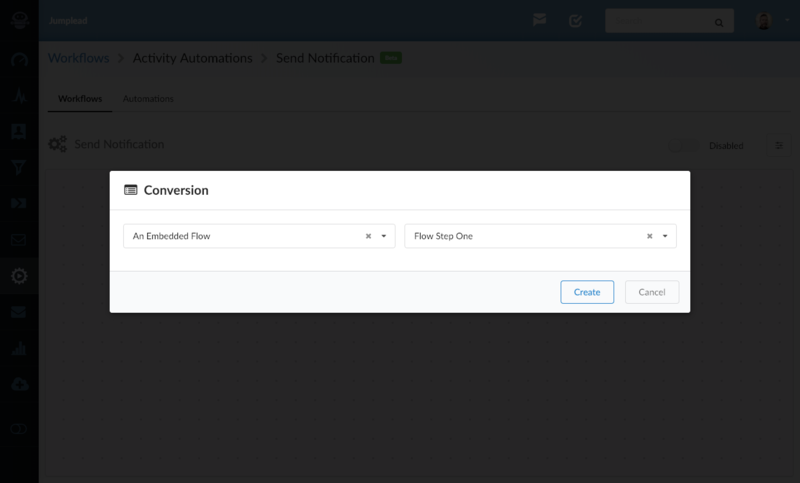 Select 'Conversion' as you will want to pick up the details from a Conversion Form or Landing Page. Choose the conversion form or landing page you want to set the Workflow up with. 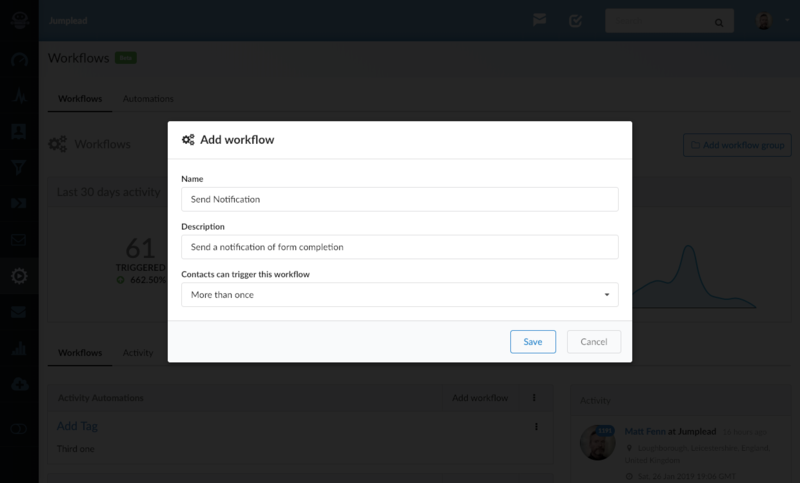 Once the Workflow is set up, you can then use it with multiple landing pages and forms quite easily as you set new ones up. Once you have picked your trigger form you'll see it is listed as the trigger action in the visual builder. 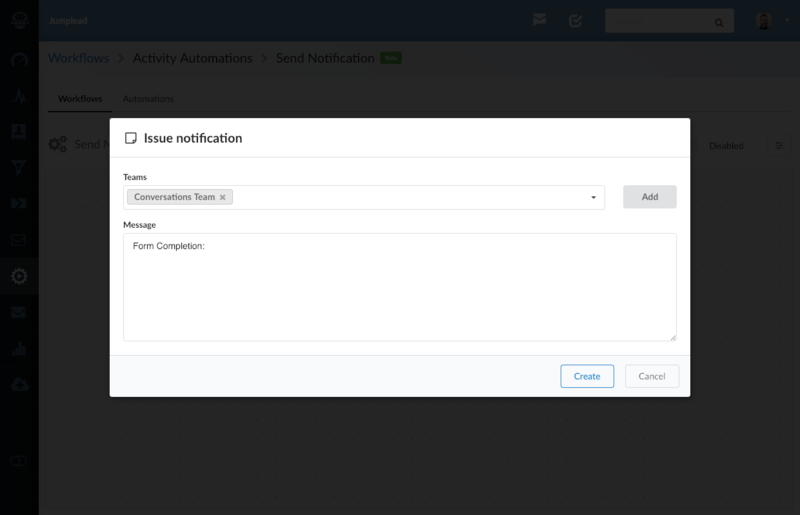 Click the '+' button and add the 'Issue Notification' action. In the 'Issue notification' dialogue box you can choose any existing Teams, and add new teams with the 'Add' button on the right hand side. You can optionally add some text into the Notification emails that are sent. The emails will automatically contain the form details completed by your contact. Save your Workflow and you will be taken back to the visual editor where you can see the whole Workflow. 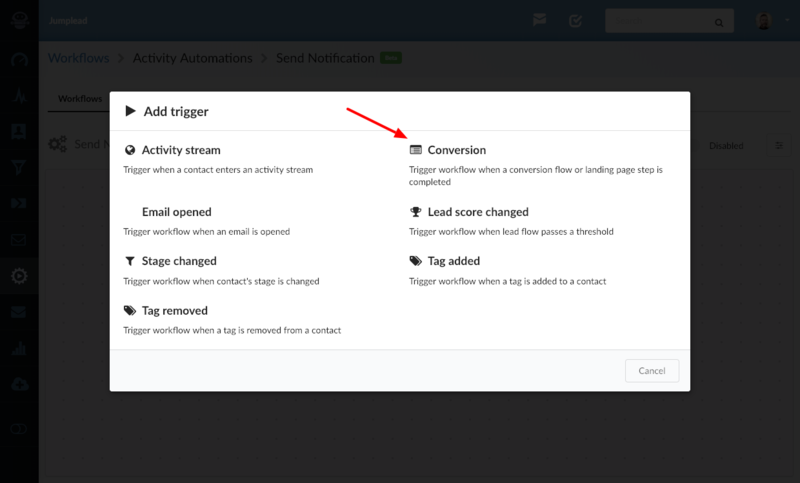 You can also optionally add any more forms or landing pages that you want to trigger this workflow from the 'Add Trigger' button at the top of the Workflow. 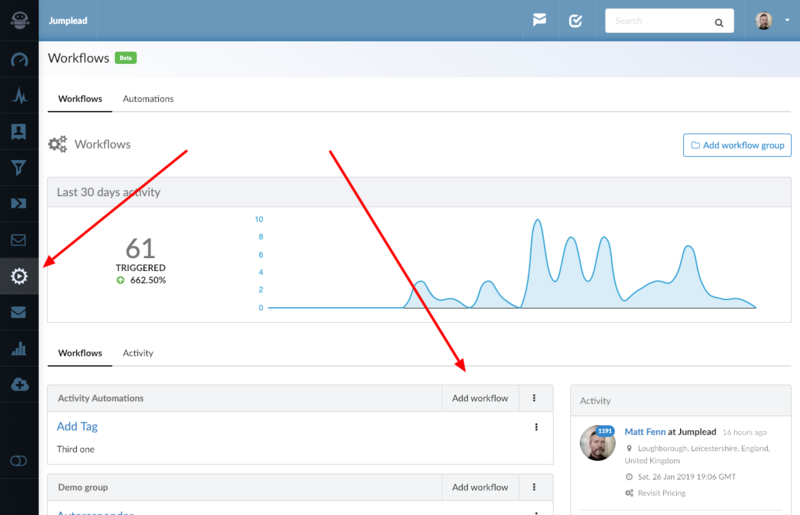 Don't forget to enable your Workflow in the top right hand side of the page. And you are good to go.